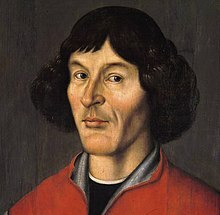 Nicolaus Copernicus  (19 February 1473 – 24 May 1543) was a Polish astronomer. People know Copernicus for his ideas about the sun and the earth. His main idea was that our world is heliocentric (helios = sun). His theory was that the sun is in the middle of the solar system, and the planets go around it. This was published in his book, De revolutionibus orbium coelestium (On the revolutions of the heavenly spheres) in the year that he died. Birthplace of Copernicus in Toruń (Kopernika Road #15, left). Together with the house at #17 (right), it forms the Muzeum Mikołaja Kopernika. Copernicus was born in 1473 in the city of Thorn (Toruń), in Royal Prussia, a mainly German-speaking region that a few years earlier had become a part of the Kingdom of Poland. He was taught first in Cracow and then in Italy, where he graduated as a lawyer of the church. He also studied medicine to serve his fellow clerics. Copernicus spent most of his life working and researching in Frauenburg (Frombork), Warmia, where he died in 1543. Copernicus was one of the great polymaths of his age. He was a priest, mathematician, astronomer, astrologer, jurist, physician, classical scholar, governor, administrator, diplomat, economist, and soldier. During all these jobs, he treated astronomy as a hobby. However, his formula of how the sun, rather than the earth, is at the center of the solar system, is still one of the most important scientific hypotheses in history. It was the beginning of modern astronomy. Wikimedia Commons has media related to Nicolaus Copernicus.